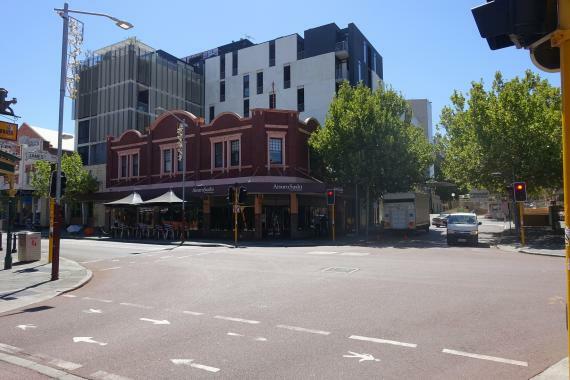 "Location is half the battle won"
•	Corner store location, at the busiest intersection in Northbridge, and arguably the most prominent shop location in Northbridge bar none. •	Extremely high foot traffic every day of the year – 7 days a week, morning and night, weekends, public holidays, etc. True 7 days a week, day and night traffic. •	Key location in the Perth cultural and entertainment hub – surrounded by hotels, museum, theatres, art gallery, car parks, tourist areas, and dozens of year round events including Fringe, fashion, pride, concerts, performances, and games and concerts at the Perth Arena. •	Long lease on site – 7 years and 10 months. •	Fully fitted, well designed, well maintained, operational restaurant site that can be used as is or easily modified to suite needs. Minimise headaches, time, and effort, for shop fitout with a shop that has an existing and running fitout. •	Approved liquor license venue with Exclusive bathrooms. •	Licensed alfresco area with professionally installed outdoor umbrellas, electric lighting & heating facilities. If you are looking to sell your Cafe and Restaurant or Restaurant business for sale, or business for sale in Western Australia (WA), Australian Business for Sale has variety of packages to choose from. Click here to read How to Sell A Business Online. Click to see shops in Australia.